1. The Arabs’ Semitic ancestors in the Fertile Crescent and Egypt produced 5 brilliant ancient civilizations, which benefited the earliest Western civilizations of Greece and Rome. These 5 are: the Iraqi Sumerian and Babylonian civilizations; the Egyptian Pharaonic civilization; the Lebanese Phoenician civilization; and the Palestinian Canaanite civilization. 2. The 3 Semitic religions of Judaism, Christianity, and Islam were all born in the Arab region. 3. The Post-Islamic Arab civilization (which is the subject of this article) contributed handsomely to the European Renaissance. Contrary to some popular Western misconceptions propagated by many Western “experts” and “authorities” on the Arab world alleging that Arabs did not have any civilization before Islam, or that Arabs were nothing more than a collection of nomadic warring primitive tribes, confined solely to the Arabian Peninsula, who spent most of their existence looking for food and water, the historical record proves otherwise. In fact, centuries before the birth of Islam, the Arabs had several civilizations, not only in the Arabian Peninsula itself, but also in the Fertile Crescent, some of which were highly advanced which elaborate development and culture. Although Arab civilization before Islam might not have had a noticeable impact on Greece and Rome, it is nonetheless important to briefly mention here the following pre-Islamic Arab civilizations in order to dispel this wrong conventional Western notion that Arabs had no civilization before the birth of Islam, were nothing but wandering nomads, and were confined only to the Arabian Peninsula. One of the earliest and most important of all pre-Islamic Arab civilizations is the Qahtani Kingdom of Saba or Sheba (10th century BCE – 7th century CE), which had an elaborate civilization, legendary in its reputation of prosperity and wealth. The Kingdom of Saba was located in the southwestern mountainous rainy parts of the Arabian Peninsula in what is known today as the regions of Aseer and Yemen. Envious of its wealth, the Romans named it “Arabia Felix” (fortunate or prosperous Arabia). The Sabaean Kingdom produced and traded in spices, Arabian frankincense, myrrh, and other Arabian aromatics. The Sabaeans excelled in agriculture and had a remarkable irrigation system with terraced mountains, incredible huge water tunnels in mountains and great dams including the legendary Ma’rib Dam, which was built around 2000 BCE. This Arab dam was considered to be one the greatest technological wonders of the ancient world. However, the tragic breaking of the Ma’rib Dam around 575, as indicated in the Qur’an, was an event of very traumatic proportions in the collective consciousness of all Arabs at the time and of later generations. The Arab Kingdom of Himyar (115 BCE to 525 CE), which was also located in the southern part of the Arabian Peninsula, had a sizable number of Arab Christians and Arab Jews (not Hebrews). The most prominent Arab Jew of this kingdom was King Dhu al-Nuwas who persecuted his Arab Christian subjects. He reportedly incinerated some of them alive in retaliation for their persecution of Arab Jews in neighboring Arab Christian Najran. From their capital city, first at Zafar and later at San’a, the powerful Himyarite kings executed military plans which resulted in the expansion of their domains at times eastward as far as the Persian Gulf and northward into the Arabian Desert. However, internal disorder and the changing of trade routes eventually caused the kingdom to suffer political and economic decline. In fact, after several unsuccessful attempts, the African Abyssinians finally invaded the Arab Himyarite Kingdom in 525. In 570, the year Prophet Mohammad (sallallaahu alayhi wasallam) was born, the Abyssinian governor Abraha sent an army of elephant-borne troops in an unsuccessful attempt to attack the city of Makkah (Mecca) and destroy its Ka’bah. In 575 the Persians invaded Himyar and ended the Abyssinian presence in Himyar. But the Persians did not last long there either. Soon thereafter Islam swept the entire Arabian Peninsula. The Arab Nabataean Kingdom was established in the 6th century BCE. It was located south of the Dead Sea and along the eastern shores of the Gulf of Aqaba in the northern parts of the Hejaz. The Nabataeans had their capital city in Petra that was a flourishing center of commerce and civilization. The Nabataeans’ great achievements and culture are still echoed in the magnificent carved-in-the-mountains monuments they left behind. Thousands of tourists from all over the world are attracted every year to this Arab region to see these monuments not only at Petra in Jordan but also in Saudi Arabia’s Mada’in Salih (i.e., Prophet Salih who warned the Thamud Arab Kingdom to worship Allah before the birth of Prophet Mohammad). The small Arab neighboring Kingdoms of Ad, Thamud, and Lihyan – all also with brilliant monuments and achievements mentioned in the Qu’ran – came under the Nabataean suzerainty for a while. The Arab Nabataean Kingdom, which at its zenith ruled much of the Syrian interior including Damascus, later became a vassal Roman state and eventually fell victim to European colonialism when it was absorbed into the Roman Empire as the “Provincia Arabia” in 195 CE. In fact, the Roman Emperor Philip, who ruled from 244 to 249, was ethnically an Arab from this Arab Nabataean region. Incidentally, this Roman Emperor who was known as “Philip the Arab”, was preceded to the Palatine Hill in Rome by a series of Arab empresses, half-Arab emperors, and the fully Arab Elagabulus of Emesa. It is also believed by some scholars that Philip the Arab was really the first Roman Christian emperor (244-249 CE) rather than Constantine I who ruled the Roman Empire (312-337 CE) 63 years after him. Another important Arab civilization before Islam was the famous Kingdom of Palmyra (or Tadmor in Arabic), which is now Hims in Syria. Although mentioned in some history books as early as the 9th century BCE, Tadmor became only prominent in the 3rd century BCE when it controlled the vital trade route between Mesopotamia and the Mediterranean. The Tadmorians had a great civilization and excelled in international trade. However, like the Nabataeans, they eventually came under the control of the expanding Roman imperialism by becoming another client Arab state of Rome. In 265 the Tadmorian Arab King Udhayna (or Odenathus) was rewarded by the Romans to become a vice-emperor of the Roman Empire because of his assistance in their war against Persia. However, King Udhayna’s widow Zainab (aka az-Zabba or Zenobia), the famous strong Arab queen wanted nothing less for Palmyra than a complete independence from Rome. She succeeded in temporarily driving the Roman invaders out of most of the Fertile Crescent and proclaimed her son Wahballat (or Athenodorus) to be the true emperor of a new independent Arab Palmyra. Queen Zainab’s Arabian independent spirit, however, deeply angered the Romans and eventually resulted in the destruction of the Tadmorian Kingdom in 273 by a powerful force of the Roman imperial army. As part of the Roman victory celebration, queen Zainab was brutally taken to Rome in golden chains. Kindat al-Muluk (or the Royal Kindah) was a famous Arab kingdom, which originated in the southern Arabian Peninsula near Yemen’s Hadramawt region. Its capital city, al-Fau, was excavated northeast of Najran in Saudi Arabia in 1972 by Saudi archaeologists from King Saud University in Riyadh. The Kingdom of Kindah became prominent around the late 5th and early 6th centuries CE when it made one of the earliest and successful efforts to unite several Arab tribes under its new domain in Najd in central Arabia. The traditional founder and ruler of Kindah was Hujr Akil al-Murar. However, the most renowned of all Kindah kings was al-Harith ibn Amr, Hujr’s grandson, who extended his kingdom’s domain north by invading Iraq and temporarily capturing al-Hirah, the capital city of the Arab Christian Kingdom of Lakhmid. But in 529 al-Hirah was liberated by its Christian Arabs who killed King al-Harith along with 50 members of his family. After al-Harith’s death, the Kindah Kingdom split up into four factions – Asad, Taghlib, Kinanah, and Qays – each led by a prince. The famous pre-Islamic Arab poet Imru’ al-Qays (who died around 540) was the prince of Qays. The continuing feuding between these Arab factions, however, eventually forced the Kindah princes by the middle of the 6th century to withdraw to their original place in southern Arabia next to Yemen. Nevertheless, after Islam was established throughout the Arabian Peninsula, many descendants of the Royal Kindah continued to hold powerful political positions within the Islamic state. In fact, one branch of the Royal Kindah was even successful in gaining great political influence in far away Arab Andalusia in the European Iberian Peninsula. The Arab Christian Kingdom of Lakhmid, which originated in the 3rd century CE, reached the height of its power during the 6th century under King al-Munthir III (503-554). Its domain covered from the western shores of the Persian Gulf all the way north to Iraq where its capital city, al-Hira, was located on the Euphrates River near present day Kufah. Working in close cooperation with the Zoroastrian Persian Sasanian Empire to which the Lakhmid Kingdom was a vassal state, al-Munthir III raided and frequently challenged the pro-Byzantine Arab Kingdom of Ghassan in Syria. His son King Amr Ibn Hind was patron of the legendary Arab poet Tarfah Ibn al-Abd and other poets associated with the seven Mu’allaqat (the Suspended Odes”) of pre-Islamic Arabia (see “The Jahiliyyah” below). The Lakhmid dynasty eventually disintegrated after the death of its great Arab Christian King an-Nu’man III in 602. As the Lakhmid Arab Kingdom was Christian so was its Arab neighbor to the west, the Kingdom of Ghassan, whose capital city was Damascus. This Syrian Ghassanid Kingdom was prominent in the 6th century and was an ally of the Byzantine Empire. It protected the vital spice trade route from the south of the Arabian Peninsula and also acted as a buffer against the desert bedouins. The Ghassanid King al-Harith Ibn Jabalah (reigned 529-569), who was a Monophysite Christian, supported the Christian Byzantine Empire against the Zoroastrian Sasanian Persian Empire and successfully opposed the Arab Kingdom of Lakhmids, which sided with Persians. As a result, King al-Harith was given the title of “Patricius” by the Byzantine emperor Justinian. Like the Lakhmids, the Ghassanids patronized the arts and many literary geniuses such as al-Nabighah al-Thubyani and Hassan Ibn Thabit. Great Arab poets like them were frequently entertained in the royal courts of the Ghassanid kings. After the emergence of Islam in the 7th century, most inhabitants of the Kingdom of Ghassan became Muslim. One of the most prominent poets of the Kingdom of Ghassan was Hassan Ibn Thabit. Ibn Thabit, who espoused Islam, wrote several famous and beautiful poems in praise of Prophet Mohammad (sallallaahu alayhi wasallam). Even in the period of Jahiliyyah (or “the ignorance” of pre-Islamic Arabia 500-622) the Arabs also had a great cultural literary civilization. Its great classical belles letters could very easily be compared to the best literary treasures developed during the later golden age of the Arab/Islamic civilization of the Abbasids and Andalusia. The Jahiliyyah era witnessed a vibrant golden age of Arab poetry and odes. Among the top pre-Islamic Arab poets, whose poems are still studied in college and pre-college curricula throughout the Arab world, are the seven legendary poets of the Golden Odes, known as the Seven Mu’allaqat (“the Suspended Odes”). These seven pre-Islamic Arab poets who belonged to different Arab tribes included: Prince Imru’ al-Qays of the Kindah Kingdom; Tarfah (by far the greatest pre-Islamic Arab poet); Zuhair; Labid (who became so overwhelmed by the power and elegance of the Qur’an that he refused to compose any poetry for the last thirty years of his life); Antar (the greatest cavalier warrior of pre-Islamic Arabia); Amru’ Ibn Kalthoom; and al-Harith Ibn Hillizah. Each one of these seven great Arab poets wrote magnificent lengthy poems accentuated with passion, love, eloquence, courage, and sensuality. Their seven golden odes, considered to be the greatest literary treasure of pre-Islamic Arabia, were accorded the highest honor by the critics of the times in the annual poetry fair in Ukaz near Makkah. Their works were inscribed in gold letters and hung (or “suspended”) on the door and walls of the Ka’bah for the public to read, enjoy, and appreciate. To these seven incomparable Jahiliyyah Arab poets one must add the following four geniuses in poetry: an-Nabighah al-Thubyani, Hassan Ibn Thabit, al-Hutay’ah, and al-Khansa’ (a female). Although most of pre-Islamic Arabia during the Jahiliyyah period was largely nomadic and tribal where bedouin wars and conflicts were the norms among the disunited Arab tribes and where most people believed in pagan religions and superstitions, the two important cities of the Hejaz, Makkah and Ukaz, stood as shining spots in the entire Arabian Peninsula. In fact, Makkah was the religious, political, economic, intellectual, and cultural center of pre-Islamic Arabia. The Ka’bah in Makkah and Mount Arafat outside it (both of which were later incorporated in Islam) had been important religious sites for annual pilgrimage centuries before the coming of Islam. Within a very short period of time after the birth of Islam in the 7th century, the Arabs built a vast empire that stretched from Spain and Portugal (Andalusia) in the west all the way to the Indian subcontinent in the east. Covering almost half of the old known world, the Arab empire was one and a half times the size of the Roman Empire at its peak. Unlike earlier civilizations, the Arab civilization dominated the Mediterranean and made it practically an Arab lake. The Arabs occupied Spain and Portugal in 711 and were on the verge of engulfing all of France in 732 when Charles Martel stopped their advances in the heart of Western Europe in the Battle of Tours, about 100 miles south of Paris. Between the 7th and 15th centuries, the Arabs established a brilliant civilization the like of which was not contemporaneously found anywhere in the world. However, since Islam united all Arabs for the first time in their history, and rejected nationalism and secularism (Islam united Arabs and non-Arabs under the banner of Islam), Arab civilization and Islamic civilization were one and the same. The two could not be separated. Several Arab powerful states were established each with its own distinct Arab civilization. The most important of these are the following three, the last two of which are considered to be the Arab golden age. These are: The Ummayad State with its capital city in Damascus (661-750); the Abbasid State with its capital city in Baghdad (750-1258); and Arab Andalusia (711-1492) in the European Iberian Peninsula of Spain and Portugal (a continuation of the Ummayad State) with its capital city first in Cordoba and later in Granada. For centuries Arab Andalusia represented Europe’s main cultural center. Although the Arab Abbasid State of the east and Arab Andalusia of the west existed at the same time, they were not united because of the rivalry between their Arab leaders. In all of the above-mentioned three major Arab States, Arabic was the official language and Islam was the official religion. However, Arabs, half-Arabs, and non-Arabs of all the three Semitic religious faiths lived together in racial and religious harmony. There was a great deal of tolerance towards Christians and Jews whether they were Arabs or not. Within all Arab/Islamic empires, Arabs played the major role in all of the political, economic, social, cultural, educational, and scientific affairs. Non-Arabs were deeply Arabized both emotionally and culturally. In short, these three Islamic civilizations (Ummayad, Abbasid, and Andalusia) were by and large Arab. However, after the destruction of the Arab Abbasid State in 1258 at the hands of the Mongols and their ruthless leader Hulagu (a crushing defeat that the Arabs have never completely recovered from), the Muslim Turks took over the leadership of the Muslim world. In an affirmation of the political unity of the Islamic nation or “Ummah” (because Islam rejects nationalism), the Turks established their Muslim Ottoman State (1258-1922) with its capital first in Bursa and later in Istanbul (Constantinople), the former capital city of the Eastern Roman Empire (or the Byzantine Empire). It was only in this last major Muslim Turkish State, which did not include either Persia or Andalusia, that the Arabs did not play a dominant role in the political or cultural affairs of the Islamic State. Nor was Arabic the official language of the Ottoman Empire in its last days. Nonetheless, inspired by numerous exhortations of Prophet Mohammad (sallallaahu alayhi wasallam) to Muslims such as: “Seek knowledge from the cradle to the grave“; “Search for knowledge, even if you must go to China to find it“; and “The ink of the scholar is more sacred than the blood of the martyr”, the Arabs excelled in science and art and provided the world with a brilliant and unique civilization. Arab civilization contributed a great deal to the world in general and to the West in particular by helping bring about the European Renaissance, first in Spain and Portugal and later in Italy. As will be explained shortly, the West is immensely indebted to the Arabs for many scientific, technological, and artistic inventions as well as philosophical concepts. As the contemporary Western civilization has enlightened the world, so did the old Arab/Islamic civilization. In fact, the Arabs were the world’s pioneers in establishing the first major institutions of higher learning. Arabs established the oldest universities in the world. The University of Qeirawan in Fez, Morocco was founded in 859, and the al-Azhar Mosque-University was established in 970 in Cairo. On the other hand, the oldest university in Europe is the University of Bologna in Italy, which was founded in 1088. Arab civilization reached its golden age during the Abbasid era (750-1258). Baghdad, the seat of the powerful Abbasid State – which the USA brutally and illegally occupied in 2003 – was the proud Arab capital city and the world’s major center for the arts and sciences. Abbasid’s Baghdad was not only the largest city in the world in size, about 100 square kilometers, but was also the world’s most crowded city, containing about 2 million people. During its heyday, Baghdad was the center of the richest and most powerful country in the entire world. It contained two of the world’s oldest and greatest universities, the Nizamiyah and the Mustansiriyah. Baghdad was also the seat of the legendary Bait al-Hikmah or (“the House of Wisdom”), the most widely-respected “think tank” and the major research center in all of the vast Abbasid Empire. From it came various important translations of Greek and other earlier non-Arab scientific manuscripts; major breakthroughs in many scientific and artistic fields; and different discoveries in various scientific fields that enriched Arab civilization and in turn benefited the West and the rest of the world. Among the great Arab inventions was the clock. Some Arab clocks had their timepieces moved by water, others by burning candles or mercury. A beautiful Arab water clock was given in 807 as a gift by the great Arab Abbasid Caliph Haroon ar-Rasheed (786-809) to the French King Charlemagne who was totally impressed by it. In fact, the 13th century Abbasid Arab genius, Ibn ar-Razzaz al-Jazari, invented impressive arrays of water-operated monumental clocks such as the famous automated Peacock Fountain and the Castle Water Clock. Before the European Renaissance (the start of the current Western civilization from 1350 to 1650), most of Europe was living in the feudalism of the Dark Ages. Europeans lived in poverty, ignorance, hunger, diseases, violence, treachery, squalor, and intolerance. Most Europeans lived in mud huts with filth, practically like animals. Dirty roadside ditches throughout Europe, filled with stagnant water, served as public latrines. In fact, most Europeans did not even wash their own bodies with water for fear of damaging their skins and health. Arab entrance into Europe began with an “invitation”. The governor of an outlying province in the Iberian Peninsula sent his daughter to Toledo for schooling. She was supposedly under the protection of King Rodrick (one of the Germanic ruthless Visigoth occupying rulers in Spain) who instead of protecting her, violated and impregnated her. As a result, her father appealed to the Arabs in North Africa for a redress of this injury. The Arabs complied, and thus began almost 8 centuries of Arab occupation and civilization in Europe’s most southwestern part. To be exact, the Arabs stayed in Europe 781 years during which they introduced to the West a wonderful civilization; religious tolerance; racial harmony; public baths; and the novel idea of cleanliness expressed in public and personal hygiene by washing the human body with water. While most Westerners of the Dark Ages lived in filth, poverty, and ignorance, the Arabs had a brilliant civilization in Andalusia, Europe’s Iberian Peninsula. From 711, when Tariq Ibn Ziyad (rahimahullah) landed with his Arab conquering army at Gibraltar (so named after him from the Arabic words Jabal Tariq or “the Mountain of Tariq”), to 1492 when the Arab presence in Europe ended, Andalusia was the most enlightened, civilized, racially and religiously tolerant place in all of the West. Before the Arabs arrived in the Iberian Peninsula, the barbarian Germanic occupying Visigoths viciously persecuted Spanish and Portuguese Jews. The Arabs not only treated local Jews with kindness and respect, but also treated their fellow Christians with the same kindness and tolerance that Islam called for. In fact, the Iberian Jews welcomed the Arab conquering army as a liberating force and joined it against the Visigoths. The intolerant Germanic Visigoths also heavily taxed and ruthlessly treated the poor Iberian peasants, rendering them practically as slaves. The Arabs, on the other hand, humanely treated the local peasants and drastically reduced their taxation. Arab Cordoba was truly the jewel of the entire world. In contrast to the dust and mud which would remain familiar features of the streets of London and Paris for 7 centuries to come, Cordoba had miles of paved streets; street lights (even seven hundred years later there was not so much as one public lamp in London); 113,000 houses with lavatories and water drainage (even poor houses had them, something which was not found at the time in most other European cities); 700 mosques; 300 public baths; 70 public libraries; numerous bookstores; parks and palaces;  and two major magnificent treasures unequal for their sophistication in the known civilized world. The first treasure was the Great Mosque of Cordoba, the most extraordinary religious shrine, second in size only to the Great Mosque of Makkah. It was completed in 976 and took 200 years to build. This Great Mosque, which is still a major tourist attraction in Spain today, is a vast rectangle with a deep sanctuary divided into 19 aisles by a forest of 870 marble columns. The interior of this marvelous religious shrine was beautifully decorated with gold; silver; precious stones; mosaics; colored tiles; contrasting green and red marbles; carved plater; wall paintings; Qur’anic calligraphy; and 8,000 oil lamps, to provide light, hung from two hundred chandeliers. The scent of burning aloes and the perfumed oils in the lamps drifted through the arches of the long naves. The Mosque’s spacious seven-sided mihrab (the prayer niche which directs worshipers toward Makkah) was lined with gold mosaics and marbles. Next to the mihrab stood the beautifully carved minbar (or pulpit) with its several straight steps for the Imam to climb up in order to give his Friday sermon. This wonderful unique pulpit, which took eight talented craftsmen seven years to make, was laced with rails of gold and silver and made of ivory, ebony, sandalwood, and citron wood. Unfortunately, this magnificent pulpit was cut into pieces when the Spanish Christians took over Cordoba in 1236. 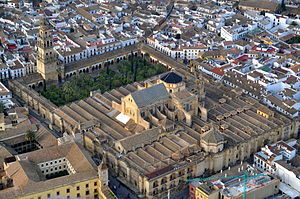 Today this great mosque is the Catholic Cathedral of Cordoba. The second treasure in the Arab Andalusian capital city of Cordoba was the outstanding enormous public library. Completed around 970, this wonderful library alone had over 440,000 books, more than all of the books in all of France at the time. In addition to this gigantic public library, there were 69 other public libraries in Cordoba. These Arab libraries had been using paper for over 200 years at a time when the few Europeans, who could read or write, were still using animal skins for writing. After the fall of Cordoba to the Spanish Christians, the Arabs moved their capital city to Granada – in the south of the Iberian Peninsula – which also became famous as an Arab center of arts and learning. Arab Granada was also renowned for its wealth and trade especially in silk. To immortalize Grenada, its Andalusian Arab rulers built the magnificent Palace of al-Hamra (“the red”) or Alhambra Palace. This unique palace has two splendid courts, the Court of the Lions and the Court of the Myrtles, considered to be the most magnificent and glorious of all Arab monuments in Spain. 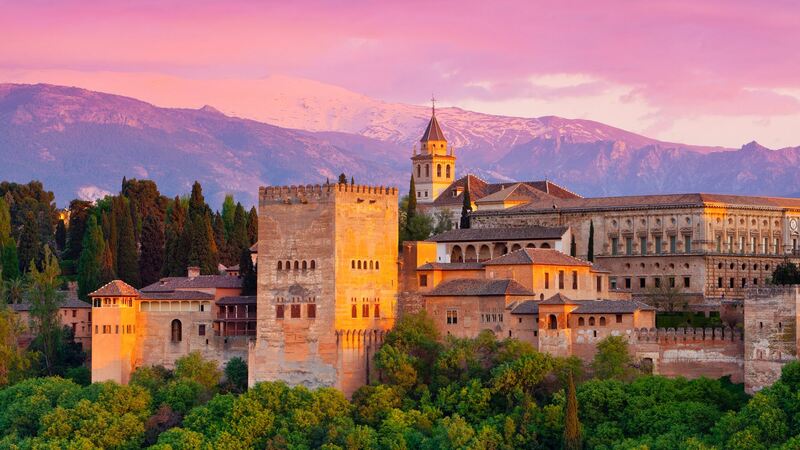 The Alhambra Palace, which was also an Arab fortress, took about 100 years to build and is today a major tourist attraction attesting to the beauty and genius of Arab architecture. In addition to Cordoba and Granada, Seville and Toledo also served as the greatest houses of Arab Andalusian knowledge. In fact, Toledo was the main center of scientific translation from Arabic to Latin. The Andalusian Arabs also produced several exotic agricultural products (see “Agriculture” below) and developed many great manufactured products, which were all exported to Western Europe and the rest of the world. These industrial products include: textiles; paper; silk; baked tile; glazed cups, dishes, and jars which rivaled Chinese porcelain; pottery; sugar refining; gold; silver; ruby; silk; various crafted metals; marble; ceramics; and the much-admired Cordovan (“cordwain”) leather-work. The sciences that the Andalusian Arabs excelled in and were taught at their universities, which helped educate several generations of Western scholars and students from all over Europe, included: mathematics, geometry, astronomy, physics, chemistry, architecture, optics, meteorology, engineering, pharmacology, medicine, biology, botany, anatomy, zoology, and philosophy. It should also be mentioned here that Arab students in Andalusia were the first to use the cap and gown worn today by students all over the world during graduation ceremony. Thanks to Islam and Arab civilization, Arabic has become the richest of all Semito-Hamitic languages (so-named after Noah’s (Nuh alayhissalaam) two eldest sons Sam and Ham), and one of the world’s greatest languages in history. As a major language of scripture and civilization, Arabic has deeply influenced several world languages both in the East and the West such as Persian, Turkish, Urdu, Hindi, Spanish, Portuguese, Maltese, Malay-Indonesian; some African languages like Hausa and Swahili; and to a lesser extent even the English language (see below). The Arabic alphabet, which contains 28 letters (2 more letters than the English alphabet), is now – like the Latin alphabet – one of the most widely used alphabetic writing system in the world used in the writing of the languages of Muslim countries like Iran, Pakistan, and Afghanistan. Between the 9th and 15th centuries, during the zenith of Arab civilization, Arabic was the international language of science to a degree which has since never been equaled by any other language including English. Arabic was not only the language of the Arab people, but also the language of many other peoples and faiths. Neither Greek, nor Latin, nor even English has ever attained the far-reaching unique historical dominance over human civilization as Arabic had. Arabic was so important as the language of science that European scholars had to learn it as they learned Latin. Today, Arabic is one of only six official languages of the United Nations along with French, English, Russian, Chinese, and Spanish. Arabic is also the World’s fourth most popular language after Chinese, English, and Spanish. And as the language of the important Arab oil-producing countries, Arabic has also achieved a prominent status in the world of international finance and economics. Indeed, as will be revealed shortly, major works in various philosophical and scientific fields were borrowed and/or copied from the Arabs by a number of leading European scholars and scientists before, during, and after the European Renaissance. The following is a brief summary of the Arab contribution to Western and human civilizations in 15 major scientific and artistic disciplines. Only the top Arab and Muslim scientists (as well as some occasional Arab Jews and Arab Christians) both from the Abbasid and Andalusian civilizations are mentioned in this survey. The Arabs and Muslims contributed more to the field of mathematics, the basic foundation of modern civilization, than any other people in history. To the magnificent Arab civilization the world owes algebra, algorithm (logarithm), arithmetic, calculus, geometry, trigonometry, the decimal system, and the brilliant “zero”. The revolutionary “zero”, which gave us what is referred to in the West as the Arabic decimal numeration system, did not originate in India as some Western historians claim but was rather developed in ancient Iraq by the Neo-Babylonians maybe as early as 500 BCE. American mathematics Professor Karl J. Smith indicated in his textbook, The Nature of Mathematics, that while the ancient Indians developed mathematical digital symbols, their numeration system offered no advantage over other earlier systems because it did not contain a “zero” or use a positional system. Although the Arabs’ Semitic ancestors in ancient Iraq developed the “zero”, it was only through the great post-Islamic Arab civilization that it was incorporated into the main body of the general mathematical theory. It took Europe almost 300 years to finally accept the “zero” as a gift from the Arabs. The Arabic numerals were simultaneously expressed in somewhat two different figures or forms, one Abbasid (the eastern style which most Arabs currently use) and one Andalusian (the western style which is used today in the Arab Maghrib countries of Northwest Africa). It was this Arab Andalusian form of numerals (i.e., 0 1 2 3 4 5 6 7 8 9) that the West and the rest of the world eagerly adopted; hence the worldwide label “Arabic numerals”. Mohammad al-Khawarizmi (780-850), the giant genius scientist who was born and died in Abbasid Baghdad, created modern algebra and made brilliant contributions in the field of mathematics. In fact, the word “algorithm” is derived from his name, and the Arabic word al-jabr (or “algebra” in English) comes from the title of his major work, Kitab al-Jabr wa al-Muqabalah (“The Book of Integration and Equation”). Served for a number of years as the Executive Director of the prestigious “House of Wisdom” in Baghdad, al-Khawarizmi was also the first scientist in history to explain how passing light through water particles creates rainbows. The most important figure in this scientific field is the Arab Abu Abdullah al-Battani (aka Albategius: 858-929) from the Abbasid era. He was the best-known Arab astronomer in Europe during the Middle Ages. 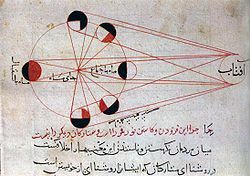 Al-Battani refined existing values for the inclination of the ecliptic, for the length of the year and of the seasons, and for the annual precession of the equinoxes. He showed that the position of the Sun’s apogee is variable and that the annular eclipses of the Sun are possible. Image: An illustration from al-Biruni’s astronomical works, explains the different phases of the moon. In the fields of physics and optics, no Arab scientist comes close to the legendary Abu Ali al-Hasan Ibn al-Haytham (aka Alhazen: 965-1039) who was born in Iraq and died in Egypt during the golden Abbasid era. Ibn al-Haytham made the first significant contributions to optical theory since the time of the Alexandrian astronomer Ptolemy in the 2nd century. In his book On the Burning Glass, he revolutionarized the nature of focusing, magnifying, and inversion of the image. Ibn al-Haytham was the world’s first scientist to give an accurate account of vision, correctly stating that the light comes from the object seen to the eye, and not the other way around as was previously believed (i.e., from the eye to the seen object). Also, In his widely-acclaimed treatise on optics, translated into Latin in 1270 under the title Opticae Thesaurus Alhazeni Libri VII, this great Arab physicist/optometrist published revolutionary theories on reflection; refraction; binocular vision; focussing with lenses; the rainbow; atmospheric refraction; spherical aberration; parabolic and spherical mirrors; and the apparent increase in size of planetary bodies near the Earth’s horizon. In fact, so complicated and so advanced were Ibn al-Haytham’s theories in physics that for a long time both Western and Eastern scientists were afraid to adopt them. But when he was finally proven to be correct, Ibn al-Haytham’s scientific pre-eminence throughout the world was no longer in doubt. The English Roger Bacon (1242-92) was not the only Western scientist on optics to admit his indebtedness to Ibn al-Haytham. Both the great Italian Leonardo da Vinci (1452-1519) and the German astronomer Johannes Kepler (1571-1630) were also deeply influenced by the scientific findings of this Arab genius. The great Persian Muslim scientist Abu Bakr al-Razi (aka Rhazes: 865-925) of Abbasid’s Baghdad was the greatest medical authority in the entire Islamic civilization. His major works were translated into Latin. A pioneering physician, al-Razi was the first to describe pupillary reflexes; gave the world’s first account of smallpox and measles; discovered the contagious characters of diseases; and differentiated among colic pain, kidney-stone pain, and the pains of the ileus. His ten-part treatise in Arabic on clinical and internal medicine, at-Tibb al-Mansuri that was translated into Latin under the title Medicinalis Almansoris, was widely influential in the West throughout the Middle Ages. In it, he discussed drugs; diets; skin diseases; child and mother care; mouth hygiene; toxicology and epidemiology; climatology and the effect of environment on health; a regiment for preserving good health; and general medical theories and definitions. In his brilliant treatise on psychic therapy written in Arabic, at-Tibb ar-Ruhani (“Psychic Therapy”), and in his comprehensive medical encyclopedia, al-Hawi fi at-Tibb, al-Razi provided considerable insight into the scope, methods, and applications of the clinical, internal, and psychiatric medicine as well as the interpretation of the general health precepts. Another medical genius was Abu al-Qasim Az-Zahrawi (aka Albucasis: 936-1013), an Arab from the great Arab Andalusian civilization. Az-Zahrawi is considered to be Islam’s greatest medieval surgeon who single-handedly shaped European surgical procedures until the Renaissance. His 30-part medical encyclopedia, At-Tasrif (“The Method”), which contained over 200 surgical medical instruments he personally designed, was a surgical treatise that had a tremendous influence on Western medicine. Translated into Latin in the 12th century by the Italian scholar Gerard of Cremona, at-Tasrif stood for nearly 500 years as the leading textbook on surgery in Europe, preferred for its concise lucidity even to the great works of the classical Greek medical authority Galen of Pergamum. Depending on animals for food, war, and transportation, the Arabs and Muslims raised the basic interest in animal husbandry to the level of a science. The first important comprehensive zoological study of animals in Arabic was Kitab al-Hayawan (Book of Animals), written by Abu Uthman Amr Ibn Bahr al-Jahiz (776-869) from Basrah, Iraq. Covering animals in and around Iraq with their characteristics, this pioneering book was written in an eloquent and interesting literary style. In it, al-Jahiz described the various diseases that afflict animals and their treatments. Another important work in this field was The Uses of Animals, written by an Arab doctor named Ibn Bakhtishu. This 11th century book is a comprehensive account of the medicines that could be extracted from animals for human use. However, the greatest medieval work in veterinary medicine is the comprehensive work by Abu Bakr al-Baytar of Cairo (died 1340) entitled Kamil as-Sina’atayn. This famous work in Arabic covers animal husbandry, birds, breeding, horsemanship, and knighthood. In it, al-Baytar also detailed animal diseases, the methods and drugs used in their treatment, and the use of animal organs in therapeutics. Arab Andalusia had a highly advanced system of agricultural engineering, an elaborate irrigation canal system, and fountains – the likes of which was not found anywhere in Western Europe at the time. The Arabs made the Iberian land produce more and better crops and introduced to Europe such exotic and valuable agricultural products as oranges, cotton, eggplants, saffron, pomegranates, apricots, rice, sugar cane, artichokes, peaches, date palms, and mulberry. In addition, Italy’s greatest poet, Dante (1265-1321), who hated Prophet Mohammad (sallallaahu alayhi wasallam) and Islam, plagiarized his greatest work, the Divine Comedy, by copying from the works of the mystic Arab genius Ibn al-Arabi rahimahullah (1165-1240) of Arab Andalusia, and also from Risalat al-Ghufran (The Epistle of Forgiveness) written by the great Arab philosopher and poet Abu al-Ala’ al-Ma’arri of Syria (973-1057). Dante’s Divine Comedy’s fundamental concepts of Heaven and Hell very closely resemble Ibn al-Arabi’s account of Prophet Mohammad’s ascent to Heaven from Makkah via Jerusalem. Ironically, however, the unthankful plagiarist Dante consigned Prophet Mohammad to the lowest level of Hell in his Divine Comedy. On the other hand, the Spanish mystic Ramon Llull (1235-1316) was also highly influenced by Arabic philosophy and Islamic mysticism produced by such Muslim mystics as al-Hallaj rahimahullah (858-922) of Abbasid’s Baghdad. Actually Arab influence was so obvious on Western philosophy that many European scholars and theologians openly admitted their great indebtedness to the Arabs. One of those who admitted his gratitude to the Arabs is the Scottish theologian John Duns Scotus (1266-1308) who was deeply influenced in his intellectual activities by the Fons Vitae which was originally written in Arabic by a great Arab philosopher of Jewish faith (not a Hebrew) from Cordoba by the name of Abu Ayyub Ibn Gabirut “or Gabirol” (aka Avicebron: 1022-70). Other great Andalusian Arabs of Jewish faith may include such scholars as the philosopher/poet Abu Haroon Moussa (aka Moses Ibn Ezra: 1060-1139), and the philosopher/physician Abu Imran Moussa Ibn Maymun (aka Moses Maimonides: 1135-1204), the personal physician of the great Salah ad-Din (rahimahullah) who liberated Palestine from the Crusaders. 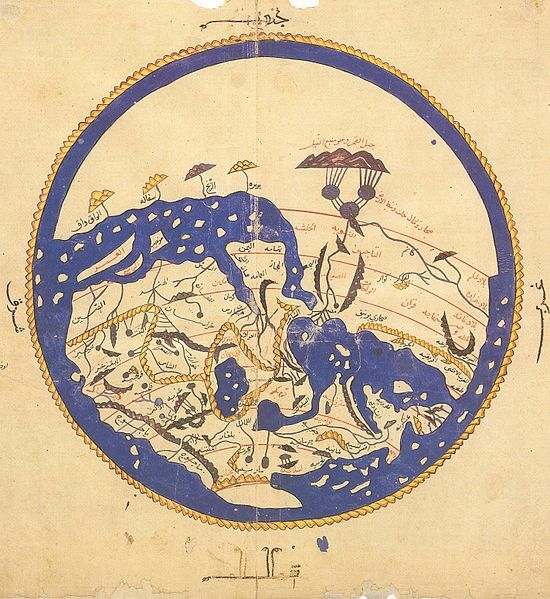 Many Arabs and Muslims made valuable contributions in the field of geography. Abu al-Hasan al-Mas’udi of the Abbasid era (died 956) – a geographer, historian, and traveler – was the author of more than twenty major voluminous works many of which were translated into Latin. He was the first Arab to combine history and scientific geography in his widely acclaimed historical-geographical encyclopedia, The Meadows of Gold and Mines of Gems. Al-Mas’udi’s encyclopedia was one of the finest and richest medieval sources not only in geography but also of geographical and anthropological information. Al-Mas’udi also wrote another 30-volume encyclopedia on world history entitled Akhbar az-Zaman (“The History of Time”). The Arabs who occupied Sicily, prior to its occupation by the Normans (Vikings) in the 11th century, made it major center of Arab sciences. Even during the occupation by the Norman Kings, Sicilian coins were minted with Arabic inscriptions and Islamic dates; many of the Sicilian records including those of the courts were written in Arabic; and it was also fashionable for Christian Sicilians to dress like Arabs and to speak Arabic. When the Christian Norman King Roger II of Sicily (1130-54) needed a compendium of the then known world, he entrusted no other geographer in the world except a Moroccan descendant of Prophet Mohammad (sallallaahu alayhi wasallam) by the name of al-Sharif Abu Abdullah al-Idrisi (1100-1166), the greatest of all Arab geographers. Al-Idrisi produced for King Roger II not only a brilliant construction of a celestial sphere but also a disk-shaped map of the known world (i.e., the world’s Eastern Hemisphere), both of which were made of solid silver. The silver map, which was one of seventy accurate maps he produced, was based on his encyclopedic work, The Book of Roger, translated into Latin in Paris in 1619. After the death of King Roger II, al-Idrisi stayed on at the court in Palermo and wrote, for his son King William I, another geographical treatise, The Garden of Civilization and the Amusement of the Soul. Al-Idrisi also wrote one of the greatest works of medieval geography, The Pleasure Excursion of One Who is Eager to Traverse the Regions of the World. The Arab legendary Abdulrahman Ibn Khaldun, sociologist and philosopher of history (1332-1406) from Tunis, was an amazingly original genius. He was the world’s first historian to develop and explicate the general laws that govern the rise and decline of civilizations. Ibn Khaldun wrote many books the most important of which is his brilliant seven-volume encyclopedia on history and societies. This encyclopedia’s first volume is entitled al-Muqaddimah (“Introduction”), which gives a profound and detailed analysis of human society and its cultural components. In it he fathered the sciences of sociology, economics, anthropology, and political science. Ibn Khaldun’s greatest contribution to human civilization is found in his “positive” philosophy of history and social evolution. It is to him that we owe the systematic elaboration of a full-fledge theory of sociological determinism. Ibn Khaldun’s study of the nature of society and social change, as well as his deference to empiricism in general, enabled him to develop “the science of civilization” which he clearly saw as a new science. It was a totally new science without any parallel in the history of ancient and medieval thoughts. Indeed, Ibn Khaldun had founded the discipline of Sociology over 4 centuries before the French Auguste Comte (1798-1857) who is credited in the West with its establishment. Not only did the West learn from the Arabs the arts of making paper books, as indicated earlier, but also the typically beautiful Arab art of leather binding with its luxurious ornamentation in “gold tooling” and its flap that folds over to protect the front edges of a book. In addition to the thousands of Arabic words that entered the various Western languages, especially Spanish and Portuguese, the rich Arabic literature itself has left some of its general imprints upon Western literature. Even though orthodox Islam does not approve of music, it was with the advent of Islamic pseudo-mysticism, such as Pseudo-Sufism, that the Arabs and Muslims began to develop a great deal of musical art, especially for religious observation. A talented Arab musician by the name of Zaryab (died 850), who moved from Baghdad to settle in Andalusia, established Europe’s first conservatory in Cordoba. Zaryab became a great singer, lute player, and music teacher. The influence of the Arab music on European music can also be found in the musical instruments the Arabs invented and/or introduced to the West. For example, in 942, the Arabs introduced kettledrums and trumpets to Europe. In fact, the West did not only adopt Arab musical instruments but also took their names as well. These include such instruments as the lute (al-ude), pandore (tanbur), and guitar (qitara). The origins of many other Western musical instruments, such as the oboe, trumpet, violin, harp and percussion instruments, can also be traced to Arab Spain. Because Islam forbids the portrayal of human figures and animals (for man must not compete with God who alone has the power to create), Arab civilization produced not only the beautiful and distinguished artistic forms of Arabic calligraphy, but also the famous “arabesque”, a unique stylish form of Arab art. Arabesque is a most perfect style of decoration characterized by an elaborate interlocking plants and abstract curvilinear motifs as well as intricate geometrical designs. Because it represents visual art in its purest form, arabesque was copied throughout Europe from the time of the Renaissance and up to the 19th century. European artists used arabesque, as the Arabs did, for the decoration of walls and ceilings; plaster panels; woodcarving; metalwork; pottery; textile; furniture; and illuminated manuscripts. In fact, the Italian Renaissance used the term “arabesque” to mean intricate design. European artists, particularly in Spain and Portugal eagerly adopted the famous Arab art of using the alphabet letters for purely decorative purposes, calligraphy. The European Gothic script was used in the same fashion as Arabic calligraphy. Sometimes Christian art itself used the actual Arabic letters as a form of decoration. For example, Arabic artistic writing in Western art could be found in the paintings of the following three great Italian painters: Giotto Di Bondone (1266-1337), Fra Angelico (1400-1455), and Fra Lippi (1406-1469). In Lippi’s great painting of the “Coronation of the Virgin”, housed in the Uffizi Gallery of Florence, the yard-long scarf held by the angels has Arabic words written all over it. During the Renaissance, Arabian turbans and other articles of Arab apparel appeared in many Western paintings, some of which even displayed Christian Saints looking like Arab and Muslim notables. Arab artistic influence could also be easily seen as late as the 19th century in the great paintings of the French Eugene Delacroix (1798-1863) who lived in Arab North Africa and was influenced by his experiences there. The style of Arab architecture was popular in the West and was copied by both European and American builders. Both the plain Andalusian horseshoe arch and the more complex cupsed arches of the mosques of Cordoba and Samarra in Iraq as well as at those of the Alhambra Palace in Granada, served as models for many arches in Perpendicular and Gothic churches in England and France. In January 1492 Granada surrendered to the Christian Spanish forces of King Ferdinand of Aragon and Queen Isabella of Castile. Although there was no final battle, but rather a final surrender, the Pope declared their victory to be a “holy war” – a crusade against Islam. Ironically, after almost 800 years of brilliant Arab civilization and presence in Europe’s Iberian Peninsula, the Christian Spaniards resorted back to the old Western uncivilized religious and racial intolerance. By brutal and barbaric acts of racism and religious intolerance, the Spanish “Christians” initiated the horribly violent Inquisition (or holocaust) against both Muslims and Jews whether they were Arab or not. The terrorist Inquisition in Spain, which was officially sanctioned by the Catholic Church and the Papacy in Rome, was actually a continuation of the general European Inquisition against non-Christians, which started some 200 years earlier during the violent European Crusades against the Arabs and Muslims of the East. In fact, the barbaric European Inquisition that started with the beginning of the Crusades in Toulouse, France, in 1229 continued for over 600 years all over Europe. This Western terrorism that included the horrors of witch-hunting and the killing and torturing of non-Christians and Christians, as well as the censoring of scientific ideas, finally came to an end in Spain in 1834. During the Spanish Inquisition, many Christians also resorted back to the old dirty European habit of avoiding washing their bodies with water, this time in order not to imitate the heretic expelled Muslim Arabs! After the “uncivilized” Arabs were expelled from Spain, all public baths were closed. The Spanish Christians rejected all forms of bathing, public or private, because they associated them with Islam and regarded them as “a mere cover for Mohammedan ritual and sexual promiscuity.”  In fact, even until today people throughout the “civilized” Western world, whether in Europe or in the Americas, still clean up with only toilet papers after using the toilet bowl, whereas all Arabs and Muslims have always used water to wash and clean up afterwards. In addition to the sudden disappearance of the virtues, such as personal and public hygiene, religious and racial tolerance, which the Arabs had introduced to the West, intellectual academic freedom in Spain also suffered a major setback. In 1499 in Granada the Spanish Cardinal and Grand Inquisitor, Francisco Jimenez (or Ximenes) de Cisneros (1436-1517), ordered the public burning of over 80,000 Arabic treasure books, and denounced Arabic as: “the language of a heretical and despised race.”  The Spanish Inquisition’s violent ethnic cleansing outlawed Muslims and Jews (Arab and non-Arab alike) from Spain until the 1890s. 1. For detailed information on Western “Orientalist scholars”, see Edward W. Said, Orientalism (New York: Vintage Books, 1979). 2. Dirk Struik, “Multicluturalism and the History of Mathematics,” Monthly Review, 46, No. 10 (March, 1995), 30. 4. Quoted in Rom Landau, Arab Contribution to Civilization (San Francisco: The American Academy of Asian Studies, 1958), p. 9. 5. Edward McNall Burns and Philip Lee Ralph, World Civilizations: From Ancient to Contemporary. Their History and Their Cultures, 2 volumes (New York: W.W. Norton and Company, Inc., 1964), p. 397. 8. Amin Maalouf, The Crusades Through Arab Eyes. Translated by Jon Rothschild (New York: Schocken Books, 1984), p. 54. 9. Albert Hourani, A History of the Arab Peoples (Cambridge, Massachusetts: The Belknap Press of Harvard University Press, 1991), p. 34. 11. Bernard Lewis, The Arabs in History (New York: Oxford University Press, 1993), p. 180. 13. David E. Stannard, American Holocaust: The Conquest of the New World (New York: Oxford University Press, 1992), p. 58. 14. Catherine Young, An Introduction to Islamic History: A Teacher’s Resource Book Grades 7-12 (Fountain Valley, California: Council on Islamic Education, n.d.), p. 1 of the section on Spain. 15. Lewis, The Arabs, pp. 131-32. 16. Duncan Townson, Muslim Spain (Minneapolis: Lerner Publications Company, 1979), p. 24. 19. Mohammad T. Mehdi, Islam and Intolerance: A Reply to Salman Rushdie (New York: New World Press, 1989), p. 21. 21. Clifford N. Anderson, The Fertile Crescent: Travels in the Ancient Footsteps of Ancient Science (Fort Lauderdale, Florida: Sylvester Press, 1972), p. 94. 22. Karl J. Smith, The Nature of Mathematics (5th ed. ; Monterey, California: Brooks/Cole Publishing Company, 1987), p. 176. 23. Abdelhamid I. Sabra, “The Exact Sciences,” in The Genius of Arab Civilization: Source of Renaissance, ed. by John R. Hayes (3rd ed. ; New York: New York University Press, 1992), p. 186. 24. Landau, Arab Contribution, p. 36. 25. Encyclopedia Britannica, 1989, vol. 1, p. 962. 26. Landau, Arab Contribution, pp. 35-36. 28. Paul Lund, “Science in Al-Andalus,” Aramco World Magazine (a Special Aramco Knoxville World’s Fair Issue, 1982? ), p. 22. 29. Encyclopedia Britannica, 1989, vol. 6, p. 451. 31. Encyclopedia Britannica, 1989, vol. 5, p. 571. 33. Ibid., vol. 1, p. 267. 34. Landau, Arab Contribution, pp. 46-47. 35. Hayes (ed. ), The Genius of Arab Civilization, p. 226. 36. Quoted in Landau, Arab Contribution, pp. 42-43. 38. Sami K. Hamarneh, “The Life Sciences,” in Hayes, The Genius of Arab Civilization, p. 213. 39. Landau, Arab Contribution, p. 44. 41. The entire section on “Zoology and Veterinary Medicine” is drawn from Hamarneh, “The Life Sciences”, p. 213. 42. Landau, Arab Contribution, pp. 52-53. 43. Hamarneh, “The Life Sciences”, p. 217. 45. Landau, Arab Contribution, p. 24. 46. Mounah A. Khouri, “Literature,” in Hayes, The Genius of Arab Civilization, p. 66. 47. Landau, Arab Contribution, pp. 25-26. 48. Lewis, The Arabs, p. 130. 49. Hayes (ed. ), The Genius of Arab Civilization, p. 266. 50. Landau, Arab Contribution, pp. 39-40. 51. Quoted in Encyclopedia Britannica, 1989, vol. 6, p. 222. 52. Quoted in ibid., p. 222. 53. Quoted in ibid., p. 222. 54. Landau, Arab Contribution, p. 58. 55. Khouri, “Literature”, p. 70. 56. Landau, Arab Contribution, p. 55-56. 58. Cited in ibid., p. 55. 59. Khouri, “Literature”, p. 56. 61. Landau, Arab Contribution, pp. 56-57. 67. Ragaei and Dorothea El Mallakh, “Trade and Commerce,” in Hayes, The Genius of Arab Civilization, p. 259. 68. Landau, Arab Contribution, p. 65. 74. Oleg Grabar, “Architecture and Art,” in Hayes, The Genius of Arab Civilization, p. 112. 75. Audrey Shabbas, “Living History With a Medieval Banquet in the Alhambra Palace,” Social Studies Review, 34, No. 3 (Spring, 1996), 25. 77. Quoted in Henry Kamen, The Spanish Inquisition (New York: The New American Library, 1965), p. 115. 78. Stannard, American Holocaust, p. 161. 79. Quoted in Desmond Stewart, Early Islam: Great Ages of Man (New York: Time Incorporated, 1967), p. 143. 80. Quoted in Shabbas, “Living History With a Medieval Banquet,” p. 25.